Course Information Designed by Mr. Osamu Ueda,who is one of the most popular golf course architects in Japan. One of the most prestigious and famous clubs in Japan. The East Course festures spacious and undulated fairways lined by age-old pine trees. Huge valley and lakes border three holes. The West Course fearures a huge lake crossing several holes,and it requires shots over the lake at six holes. This club has played to host many major PGA tournaments such as Dunlop Open, Asia Pacific Open, Japan Senior Open and etc. 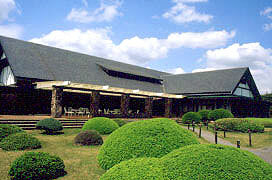 This was ranked No.27 in Japan's top 100 golf courses in 2006 by E-Golf. Days of Play This course is a strict membership course and open to visitors on Mondays only, however, golf club members outside Japan may request tee times even on another days of the week. Handicaps Required for the plays except for Mondays. No maximum handicaps.